After hitting two home runs and driving in four in a 4-0 win over the Houston Astros on Wednesday, New York Yankees slugger Giancarlo Stanton discussed a talk he had with manager Aaron Boone. According to ESPN.com's Coley Harvey, Boone said he told Stanton the following Tuesday after consecutive 0-for-4, three-strikeout showings: "There's going to be many nights when you carry us when the rest of the team is struggling." Stanton made Boone look like a prophet Wednesday, and the reigning National League MVP suggested that the confidence his manager had in him went a long way toward breaking him out of his slump: "It's always good to hear that. It's been a long time coming, but just got to be patient and know that it's a long season. And there are going to be games like this, and there are going to be games where you're on the other side of it." Stanton pushed his 2018 numbers to .240 with seven homers and 19 RBI. 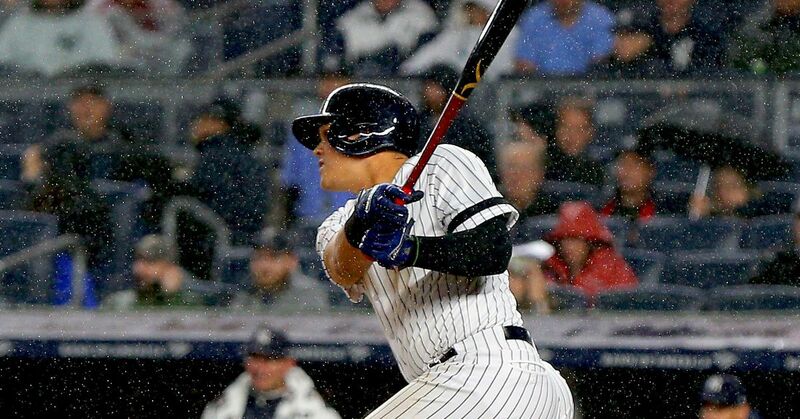 Stanton provided all the offense in helping the Yankees take two in a row on the road against the defending World Series champions. He hit a two-run home run off Astros starter Dallas Keuchel in the first inning that barely cleared the wall in right field, but his solo shot to left in the fourth was more of a no-doubter. Stanton then put the game away in the eighth when he drove in outfielder Aaron Hicks with an RBI double. While Stanton was pleased with his performance, he stressed the importance of keeping the momentum going: "There are breakout nights, but you've got to go back to the drawing board and get it done. You need breakout weeks. One day ain't going to do it." Despite Stanton's slow start, the Yankees are 20-10, two games behind the Boston Red Sox for first place in the AL East. Didi Gregorius and Aaron Judge have picked up the pace with Stanton finding his stroke, while youngsters Miguel Andujar and Gleyber Torres have been solid contributors as well. Stanton is well off the 59-homer pace he set last season with the Miami Marlins, but if his performance Wednesday turns into a hot streak, then an already potent Yankees team will become even more lethal.